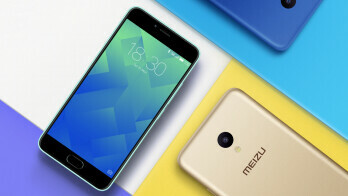 If you live in the United States, chances are you’ve never heard of Chinese _phone_ maker Meizu. The company has grown to sell some 22 million phones in 2016, with almost 90% of them sold in China. That ranks it among the bigger _phone_ makers over in the world’s most populous nation, and with that popularity, some enthusiasts who have heard about the brand might wonder: what’s special about Meizu phones? How would they work if you import one to the U.S.? Actually, certain Meizu handsets do end up being sold through some European retailers, but the exposure is patchy at best. 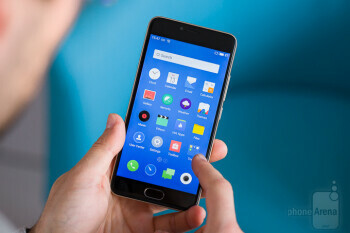 The Meizu M5 that we have up for review here is the company’s most affordable phone: a 5.2 incher with an entry level MediaTek system chip, it still packs the important for security fingerprint scanner and a few other extras. Join us for our full Meizu M5 review to see whether it’s worth considering for buyers who are willing to experiment with importing a phone from China. The M5 is made of semi-matte plastic which feels warm and inviting, plus it looks good and does not get smudged with fingerprints. The Meizu M5 is an affordable phone, and you can tell by its design: it’s an all-plastic body that, depending on the color, might fool you into thinking you are looking at a metal phone from afar. It’s not, but the semi-matte plastic on it feels nice to touch and does not catch annoying fingerprint smudges. The body itself is neither too thick, nor among the thinnest: it measures 0.31 inches (8 mm) in thickness. The phone is also fairly light-weight at just 4.9 ounces (138 grams). The right screen and body size for a phone is a subjective matter, but it feels like 5.2 inches is around the golden mean: neither too large, nor too small. This is a nice size that will suit many people. The fingerprint scanner is a nice extra for such an affordable phone: it is fast and fairly reliable, we had no issues with it. You should also know that the phone uses a microUSB port for charging, no fancy USB-C port here. And yes, it has a 3.5mm headset jack. Finally, you have five color options to choose from: mint green, champagne, matte black, glacier white, and sapphire blue, which is more than sufficient variety. A 5.2” display with cold, bluish colors that appear slightly washed out. It’s not too bad, but it’s definitely one of the weak points of the phone. The Meizu M5 sports a 5.2” IPS LCD screen with a resolution of 720 x 1280 pixels. The screen is usually one of the weakest points in an affordable phone, and the Meizu M5 is no exception. First, there is a noticeable light bleed on the top of the display on our unit (a slight one on the bottom as well). Secondly, colors are on the cold side: whites appear bluish and overall colors are not perfectly balanced. The screen definitely lacks in liveliness, colors look a bit washed out. Good news is that the screen gets fairly bright (we measured peak brightness of 466 nits) and it’s not too reflective, so it’s reasonably easy to read what’s on the display even on a bright, sunny day. The 720 x 1280 pixel resolution works out to a pixel density of 282 ppi. What this number means is you can see some slight pixelization and jagged edges here and there. We don’t find this to be a major issue, though (the bluish colors seem like a bigger issue in daily use), but again, something to consider. We should also note that there is an ambient light sensor – and believe it or not some affordable phones still lack one – that adjusts screen brightness automatically. It is a bit on the slow side and does not gradually adjust the brightness, but instead jumps abruptly from dark to bright. Still, it works, and we’re happy with both how bright, but also how dark the screen can get at night, so that it does not hurt your eyes when you read in bed. 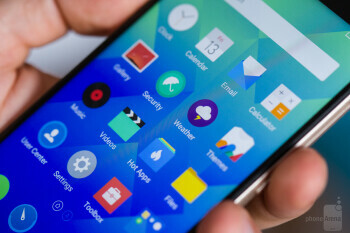 If you live in the United States, chances are you’ve never heard of Chinese phone maker Meizu. The company has grown to sell some 22 million phones in 2016, with almost 90% of them sold in China. That ranks it among the bigger phone makers over in the world’s most populous nation, and with that popularity, some enthusiasts who have heard about the brand might wonder: what’s special about Meizu phones? How would they work if you import one to the U.S.? Actually, certain Meizu handsets do end up being sold through some European retailers, but the exposure is patchy at best. The international version of the M5 runs on the custom Meizu Flyme OS based off of Android 6 Marshmallow. It is a flat skin that draws inspiration from iOS in many ways. 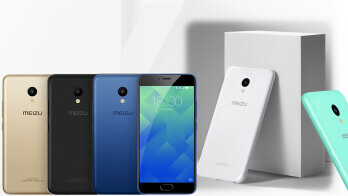 The international version of the Meizu M5 ships with the company's Flyme OS built on top of Android 6.0 Marshmallow. Our model did not feature Google services pre-installed, so we had to use the Hot Apps application, where there is a one-click installer for the Play Store, Gmail, YouTube and all the rest. Installing them is not a tough task, but still one more hassle that you have to go through. Like most user interfaces originating in China, the custom Flyme OS draws inspiration from iOS: it lacks an app drawer and features similar gestures like a swipe to bring up a quick search (it’s a swipe up, though, not down). You can even tap the status bar in apps like the browser to go to the top of a page. Getting used to Flyme OS is not too hard, but it still feels slightly foreign. What you get in exchange for that inconvenience, though, is a platform that features animations that are surprisingly fluid. There are some slow-downs, though, but more on that later. The M5 also ships with a TouchPal keyboard. It's a decent keyboard, but the keys are unsightly and in terms of accuracy and vibrational feedback, I found myself making much more errors than on Samsungs and LGs. There are some nice shortcuts to it, though: a neat slide down gesture instantly brings alternative characters (used perfectly with numbers) and this makes typing your passwords so much easier. Running on a base-level MediaTek system chip, the Meizu M5 starts all apps with a slight pause, but once it runs them, it works smoothly. The Meizu M5 runs on the MediaTek MT6750 system chip, and it’s a base-level SoC with an octa-core CPU featuring eight Cortex A53 cores in two clusters. Okay, let’s not get too technical and put it this way: this chip performs about on par with the processor in the iPhone 5 from some 4 years ago. In fact, the iPhone 5’s Apple A6 chip outperforms this particular one in the popular CPU measurement benchmark Geekbench. In reality, the Meizu M5 is fairly well optimized and runs fine most of the time: mostly smoothly and stutter-free. Stutter-free does not mean fast, though: there is a very noticeable wait time every time you start an app, the screen goes white and you have to wait for a moment for the app to load. And It happens practically with all apps, even the dialer. Once the app starts it does not stutter or drop frames, but there is this slight slow down right before an app starts. We also noticed that app installs took surprisingly long times: inexplicably, it took us few long minutes to install Facebook and Messenger. And this is clearly not a phone for gamers or heavy users. It takes just a bit longer to open apps and while it can handle basic games, we would not count on the M5 if we were into more serious mobile gaming. You have two versions of the Meizu M5: a 16GB model and a 32GB variation. 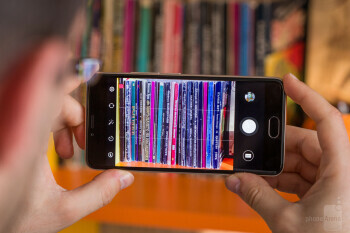 This refers to the on-board storage, of course, but you can also expand that storage via a microSD card on both phones, with cards of up to 128 gigs accepted. 4G LTE connectivity is not compatible with US bands, but it will likely work in Europe. The M5 ships with a default browser that we do recommend using. Google Chrome, the most popular Android browser, for some reason performs very poorly here, it stutters and lags, so we do not recommend using it on this particular handset. The Meizu M5 is a phone made for China, the Asian market, India and some European markets. This shows particularly in connectivity: while the phone supports 4G LTE, it does not have support for the bands required by carriers in the United States. If you are thinking about importing this phone, you should know that it will max out at 3G connection in the U.S., something that is definitely a drawback. But then again, keep in mind that Meizu is not officially selling this phone in the U.S. The full list of supported 4G LTE bands for the Meizu M5 (international version) includes FDD-LTE bands 1, 3, 5, 7, and 20, as well as TDD-LTE bands 38 and 40. Just as a reference, here are the main bands required by each of the popular U.S. carriers. The support for bands 3, 7 and 20 is good news for European users. Meizu is selling the phone in Spain and Italy, where it will supported the required 4G LTE bands, and even if you get it in other countries (where it's not sold officially), you would likely still be able to use 4G LTE. In terms of other connectivity, you also have dual-channel Wi-Fi a/b/g/n, an important step up for an affordable phone, as many affordable phones only support single channel Wi-Fi and in urban areas those frequencies are already too crowded, resulting in reduced network quality. We’re glad to see Meizu stepping up the game here. There’s also Bluetooth 4.0, A-GPS and Glonass, but the phone does not support NFC. 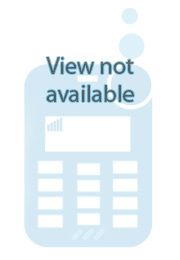 The latter means you will not be able to use this phone for wireless payments. Very good image quality, but video falls short of expectations. 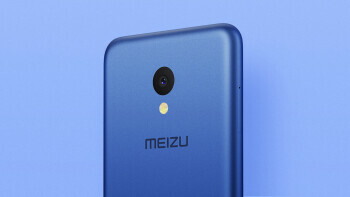 The Meizu M5 features a 13-megapixel rear camera with phase-detection auto-focus, a single LED flash and an f/2.2 lens, as well as a 5MP front-facing selfie shooter. The camera app is rich in options and you have various modes to choose from: manual (with control over ISO, shutter speed and more), video, beauty (a skin smoothening effect), panorama, light field (combines multiple pictures into one that you can change the focus on after the shot), slow-mo, QR scan, macro and Gif. Having options can be a good thing, but we found ourselves confused to switch from still photo to video, a thing that should be easy and quick to find. Meizu has unfortunately overcomplicated its camera app: this and simple things like changing the resolution is unnecessarily complicated, instead of a simple figure like 13MP or 5MP, you get complicated resolutions like 4160 x 3120, which is absurd. The camera settings also don’t rotate when you use the phone in landscape, which is a bit annoying. Image quality on the Meizu M5 is very good. We’re particularly impressed with the presence of phase-detect auto-focus in such a cheap phone. 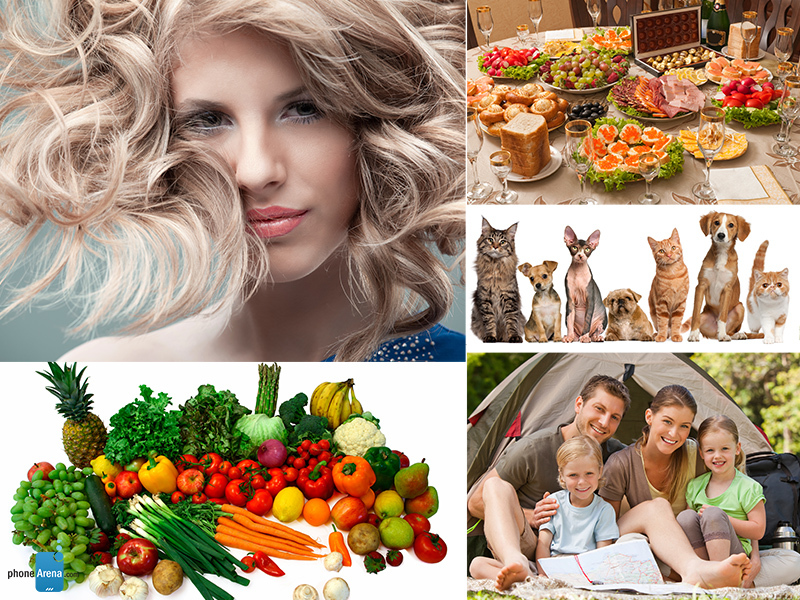 It’s very fast and accurate, and will ensure that you will have less out-of-focus pictures. There are some instances where the focus hunts a bit (notice the failed, blurry snow angel pictures), but in general, it performs admirably well. Colors are fairly true to life and macro images in particular turn out well, with sufficient detail. Don’t expect miracles of this camera in low light, though: detail quickly becomes smudgy as the level of light drops, and the flash introduces an unpleasant cold tint to pictures. The 5-megapixel front camera is not among the most impressive ones for selfies. Sure, it is able to capture a usable picture, but not one that you will necessarily want to share with the world: it lacks in detail and color saturation, so that most selfies look a bit lacking in life as well as a bit blurry. The Meizu M5 is able to record 1080p Full HD videos at 30 frames per second using its rear-facing camera, and the quality is decent, but not much more than that. With no form of video stabilization, every slight movement of your hand is reflected in the video. This is the biggest flaw of this handset: videos are just so shaky. For all else, the fast auto-focus is an excellent asset for video recording and color is captured mostly well, and detail is decent as well. The front camera can also record 1080p Full HD videos, but the quality is inferior. The loudspeaker is sufficiently loud, but audio lacks any sort of depth and is not particularly clear. There is a single bottom-firing loudspeaker on the phone and when you crank it up to its loudest it gets loud enough, which is what most users would care about. If you look on a slightly deeper level, though, it’s apparent that the speaker does not shine with clarity or any sort of depth. Quite the opposite, it sounds a bit tinny and lacks pronunciation. It’s okay for the occasional speakerphone voice call or YouTube video, but not something to be excited about. We had no major issues with call quality on the Meizu M5. Sure, it does not have the highest quality speaker or mic, but it is able to convey callers voices in a loud and clear enough manner. Battery life is decent, the phone can get you through a full day of use, but re-charge times are excruciatingly slow. The M5 comes equipped with a decently sized 3,070 mAh battery that does a better than average job. We found it easy to get through a full day of use and averaged around a day and a half on a single charge. Here are the official battery numbers by Meizu: 5 hours of video recording, 9 hours of gaming, 37 hours of calls and 66 hours of music playback. Not too shabby. 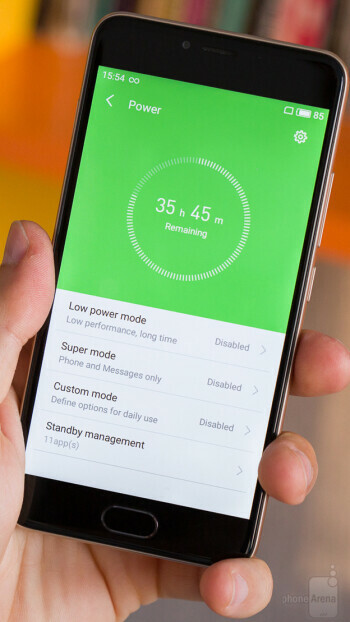 We also ran our custom battery test that we do for all phones: we set the brightness at 200 nits, a level comfortable for indoor use, and we run a workload that simulates typical usage. The result we got is way above the average and near the top: the Meizu M5 scores 9 hours and 18 minutes. What we were not happy with, though, is how long it takes to recharge the phone. Using the in-the-box 10-watt Meizu wall charger (5V at 2 amps), it took us an excruciatingly long 3 hours and 9 minutes to get the battery from 0 to 100%. This will not be much of an issue for nightly charges, but those who want to top up their battery at lunch time just to get that needed battery boost, will find it way too slow. 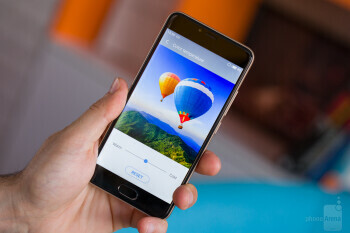 The Meizu M5 is a likable affordable phone made in China and made for China, with an international version targeting India and a limited number of European countries. The goal of our review, however, is to understand how it will perform for the Western customer. First, let’s consider the price: while in China you can buy if for $100 for the 16GB model and $130 for the 32 gig version, international shoppers can go with one of two options. One is to wait for the phone to launch in their market: in Italy and Spain, the M5 will cost 169 euros for the 16-gig and 189 euro for the 32GB model respectively. Option two is to import it from a third-party retailer for $150 for the 16GB and $200 for 32GB version. At those higher prices, the phone loses some of its competitive edge. The lack of proper 4G LTE support for the US should be considered, but let's keep in mind that the phone is intended for other markets. The more important drawbacks of the Meizu M5 are its slightly washed out display, the interface that feels somewhat foreign and the slight stutter that accompanies the start of every app. What are your alternatives? You can buy the better Moto G4 Plus for just slightly north of $200, yet it’s a much better phone in all aspects: it’s faster, features an interface that is made for Western markets and features fast charging, (plus, it has full 4G LTE compatibility with major US carriers). The new Honor 6X is also a nice option with a metal design, faster chipset, better and sharper screen, and a larger battery. Even more affordable phones like the Samsung Galaxy J3 (2016) and the Alcatel Shine Lite can give the Meizu M5 a run for its money. While it is definitely a great value in its home market of China, the Meizu M5 is less of a bargain in Europe and it faces some tough competition from established brands that often offer more in terms of design and support.